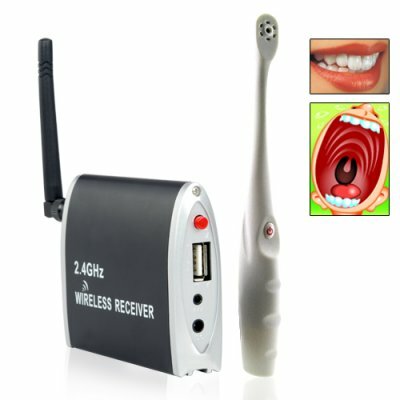 Successfully Added Wireless Dental Camera - AV or USB Connection to your Shopping Cart. Wireless Dental Camera - AV or USB Connection. Inter-oral camera with a wireless transmitter built in for ease of movement while using the camera. A easy to use device, perfectly suited from everyone from dentists, to teachers, to just plain curious people, and available at a super low price that only gets better the more you order. thanks guys! its very fast delivery. and im well satisfied with the second cam also. now im going to buy the third one from you. reserve me another one guys!. thanks very much. and its working great. Good camera but slow delivery , maybe because i´m in Brazil but i´m satisfied. its amazing. i never payed for a Chinese web site before. but i recommended to buy from chinavasion with no hesitates and lose packages. its a great place to do business for people who starting from the first step. im waiting to buy a lot of this camera as soon as possible. nice teem and great support. on 2009-11-19 13:57:01 FAST DELIVERY & great product ! wow finally its working! Honestly i was in doubt to order i thought its a scam but kinda excited to received the unit, as a dentist its a big help to examine the tooth of my patients its been a long time since i want to have this kind of unit but its a little bit expensive in all dental suppliers ,its good to let the patient see thier teeth on the screen....Got a little prob at first coz havent received the driver for my laptop which is VISTA but i can use it in TV also great ...but now its okay the staff are so accomodating ... now am using it on my patients .thanks CHINA vasion coz my patients are amaze with my DENTAL ORAL CAMERA .....LOVED IT!